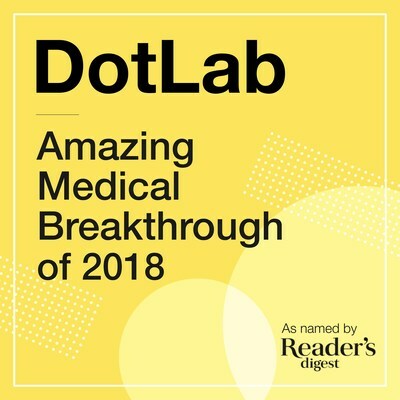 SAN FRANCISCO, Dec. 6, 2018 /PRNewswire/ -- In its annual review of medical and scientific discoveries, the publication Reader's Digest named DotLab as one of the "Amazing Medical Breakthroughs of 2018." DotLab is recognized for its DotEndo product - the world's first-ever, non-invasive test for endometriosis. "Today, the gold standard for endometriosis diagnosis requires invasive and expensive laparoscopy, and DotLab is changing the landscape for women's diagnostics through personalized medicine and machine learning," Heather Bowerman, DotLab's CEO and founder said. "As Reader's Digest noted, science is always marching forward, and we are proud to be named as one of the most exciting advancements of the year alongside important technologies across medicine." Nnoaham KE, et al. Fertil Steril. 2011;96(2):366–373.e8. Mihalyi A, et al. Hum Reprod. 2010;25(3):654–664. DotLab is a female-founded personalized medicine company committed to delivering breakthrough diagnostics to women's health. DotLab's first product, DotEndo, uses novel disease-specific biomarkers and machine learning in DotEndo, its proprietary, non-invasive technology to diagnose endometriosis. DotLab's CEO Heather Bowerman has been recognized by Goldman Sachs as one of the 100 Most Intriguing Entrepreneurs, by the MIT Technology Review as one of the world's top 35 innovators, and as a Disruptive Founder of the Year finalist by Rock Health. Reader's Digest is an American digital and print publication with a print audience of 19.3 million. The publication offers a unique stream of advice, stories, humor, and user-generated content that connects on a personal level with a rapidly growing audience of readers. Its content has the unusual power to inspire, inform and entertain across multiple generations, reinforce optimism and belief in the human spirit. The magazine was founded in 1922 by DeWitt Wallace and Lila Bell Wallace.